Mare Rossianum est altus Oceani Australis sinus Antarcticus, inter Terram Victoriae et Terram Bariae Byrd situs. Mare Rossianum ab Iacobo Ross anno 1841 inventum est. Ad occidentem iacet Insula Rossiana, cui est mons ignifer Mons Erebus, ad orientem Insula Rooseveltiana. Pars australis a Pluteo Glaciei Rossianus tegitur. Roald Amundsen expeditionem ad Polum Australem anno 1911 ex Sinu Cetaceorum coepit, super hunc pluteum sito. Ad occidentem Maris Rossiani, Fretum McMurdoense est portus aestate plerumque glacie liber. Australissima maris pars est Litus Gouldianum, circa ducenta milia a Polo Australi Geographico situm. Nova Zelandia adfirmat omnes massas terrestres Maris Rossiani in iurisdictione Dependentiae Rossianae patere, sed paucae civitates non inter eas Consortionis Populorum hanc postulationem agnoscunt. Despectus in Mare Rossianum (1999). Flora et fauna existimantur similes eorum regionum australium Antarcticarum. Praesertim aestate, aqua marina abundantiam vitae planctonicae sustinet, quae vicissim victus maiorum specierum fit, sicut pisces, pinnipedia, cetacea, avesque maris et litoris. Litorales maris partes nonnullos feturae locos Spheniscidarum Pygoscelis adeliae et Aptenodytis forsteri comprehendunt, quae in variis locis circa Mare Rossianum prope litus et in mari aperto observantur. Maris Rossianum est una ex ultimis marium partibus in orbe terrarum ab industria humana immotis. Qua pro causa, id paene omnino manet pollutione, nimium piscatus, et introductione specierum invasivarum liberum. Mesonychoteuthis hamiltoni decem metra longus et ponderis 495 chiliogrammatum in Mari Rossiano die 22 Februarii 2007 captus est. ↑ 2.0 2.1 "Ross Sea" in Encyclopaedia Britannica Online. Glausiusz, J. 2007. Raw Data: Beacon Bird of Climate Change, Discover Magazine. Gunn, B. 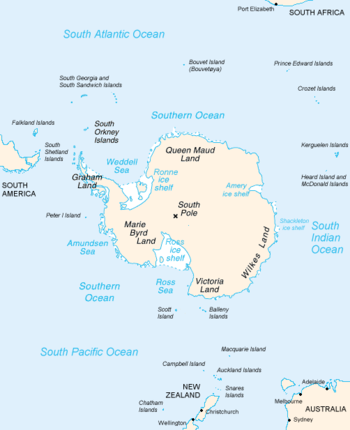 "Geology The Ross Sea Dependency including Victoria-Land," www.rosssea.info. Hansen, K. 2007. "Paleoclimate: Penguin poop adds to climate picture," www.geotimes.org. International Polar Foundation. 2007. "Interview with Dr. Steven Emslie: The Adélie Penguins' Diet Shift," www.sciencepoles.org. Hogan, C. Michael. 2011. Ross Sea, in Encyclopedia of Earth, edd. P. Saundry et C. F. Cleveland. Vasingtoniae: National Council for Science and the Environment. Locarnini, R. A. 1995. The Ross Sea, Quarterdeck 1(3). Department of Oceanography, Texas A&M University, College Station, Texiae. North Korean boats caught fishing in conservation area, www.radionz.co.nz.